The plastic foam pipe insulation tubes sure seemed like a good idea, but the leaves on both Amorphophalluses died anyway, before the A. bulbifer could grow a replacement bulb. Which is the bad news. The good news is that the A. bulbifer, at least, is willing to grow a replacement leaf in the same season, so I haven't lost the plant entirely after all. The A. konjac hasn't done anything yet to indicate that it's thinking about replacing the leaf that died. 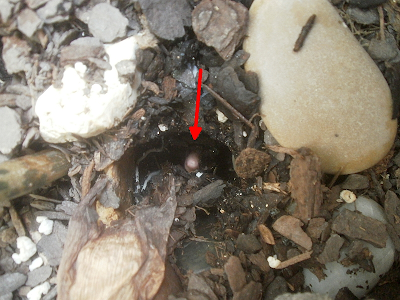 I can see the top of the original tuber when I look down into the hole left by the leaf, and it's at least not dead. Which is something to cling to for the moment, I guess. 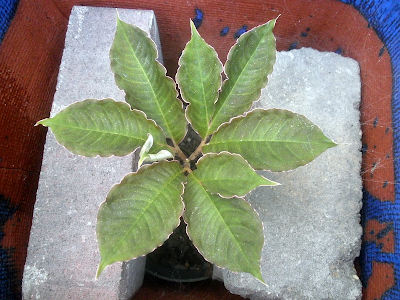 One of the A. konjac offsets also got a wind-bent leaf, which subsequently came off, but two remain. 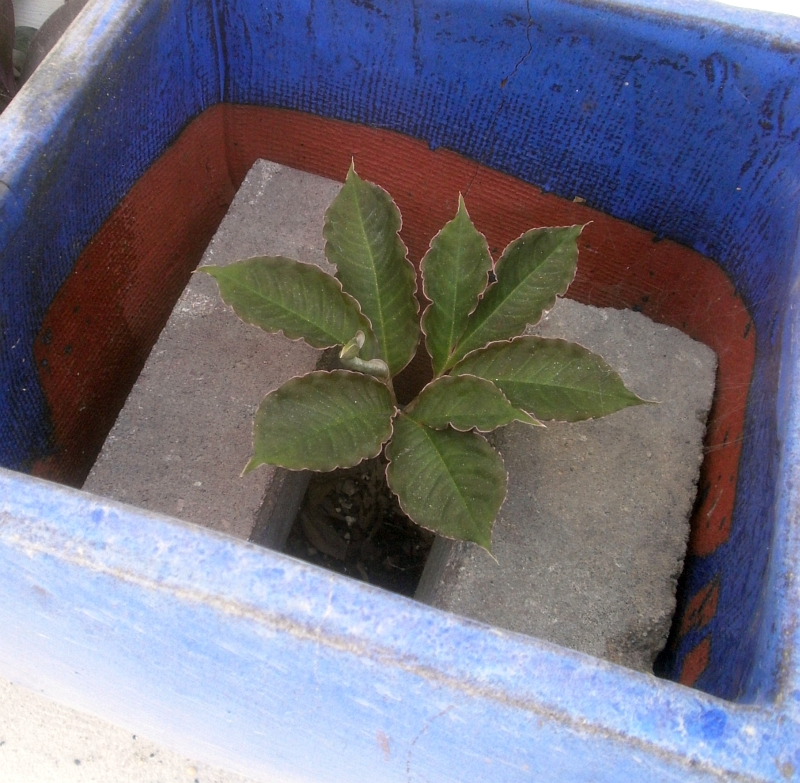 At least in theory, they should be able to hold on until the fall, and then I will have more than one konjac. Which I will put outside in a timely fashion next year even if it means I have to move them in and out a lot, because that's how excited I will be about having more than one konjac. Still oiling the plants in the basement. This is going . . . okay. Both Breynia distichas have responded to the oil by dropping about 50-75% of their leaves, which is unfortunate. Though I knew there'd be some plant that had problems with it. I had expected the Agave victoriae-reginaes to object to the oil, since they'd had problems with the neem oil two years ago. But apparently that was something specific to the neem, not oil in general, because they're fine. All the Anthuriums have been oiled twice so far (maybe three times by the time you read this; I am supposed to spray them a third time on Monday), and I haven't seen any scale since I started. That's not necessarily due to the oil; I wasn't seeing scale regularly in the first place. It nevertheless seems like a good sign. I saw a couple thrips right after the first spraying, and I think I saw another couple after the second spraying as well. At the time, that was depressing, but considering how many I ran into before the first spraying, I'm thinking now that it's a serious improvement, if I have to search and search just to find two. I've also updated the "plants I've tried" list, just under the header, for the first time in like seven months, and added a "cause of death" line for the many, many plants on that list that I am no longer growing. So if you've sent me a plant at some point in the past, and you're curious about whether or not it's still alive but you don't want to ask me directly because that would sound accusatory, now you can find out its fate without having to ask. 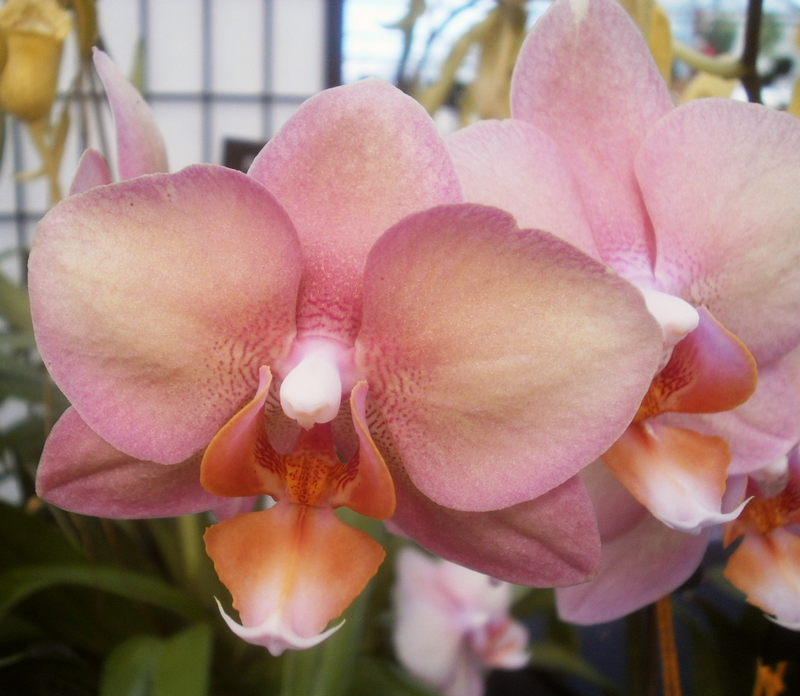 So the problem with the name is that although the orchid registry knows of lots of cultivars with "I-Hsin" somewhere in the name (these are apparently all bred by the same person, W. T. Chien), "I-Hsin Ballor" is not one of them. I-Hsin Ballerina looks very different, when you search Google for images, and I-Hsin Balloon is not exactly the same but is a lot closer to my pictures. So my guess here is that this is actually I-Hsin Balloon, and somebody in the long chain of transcriptions that runs between W. T. Chien and the Illowa Orchid Society has really bad handwriting, or needs glasses, or something. There's still one point of confusion, though, even if we accept this as I-Hsin Balloon, which is that the orchid registry lists Doritaenopsis I-Hsin Balloon as Phalaenopsis Sogo Lisa x Phalaenopsis I-Hsin Gem (Ref. 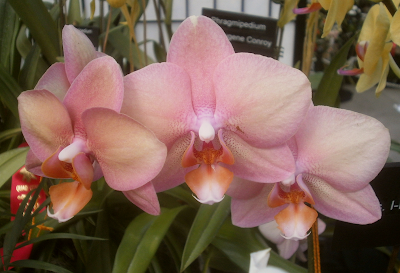 ), neither of which are Doritis or Doritaenopsis, so exactly where do they get off calling the progeny of that cross a Doritaenopsis? I'm choosing to deal with this discrepancy by pretending that I didn't notice, and I encourage you to do the same.